Which kinds of car records are the most important? Well-kept records can be instrumental in correctly diagnosing a vehicle problem the first time. 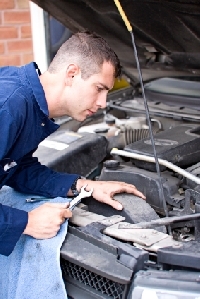 Incomplete records can lead to redundant auto repairs that waste your time and money. Another important list to keep is a specifications record list. This lets you record all the information you need to buy the right parts for the model, make and year of your car. Keep a tool checklist so that you can tell what you already have and what you need assuming you do a lot of repairs yourself. Most cars require tune-ups approximately every 30,000 miles; some new cars don't require tune-ups until 100,000 miles. For maximum protection, most oil companies say to change the oil every 3,000 miles, or three to six months regardless of what type of driving you do. The oil filters should be adequate for the 3,000 mile oil change interval but may run out of service capacity long before a second oil change at 6,000 or 15,000 miles. You should replace the oil filter every time the oil is changed. Remember that the oil filter filters out particulates that enter the oil and keeps them out of the engine. Keep track of the work done on the transmission. Recommended change interval for older vehicles is every 24,000 to 30,000 miles. For newer vehicles, see the owner's manual. Repairs, other than those already covered, should be recorded. You have such items as the muffler, carburetor, starter, battery and so on. Tire repairs, rotations and replacements should be kept separately. Tire rotations should be done every 6,000 miles. As your car ages you should keep track of the gas mileage. You can tell how much wear and tear the car has experienced. Your gas mileage may decline a bit. You can improve it by changing different oil types, rotating your wheels and with tune-ups. If you use your car for business then keep track of the repairs and keep expense receipts. You may be able to deduct these expenses. For starters, keep a notebook in the car and write down your odometer reading at the beginning and end of the year. In between you should jot down your beginning and ending odometer reading for each business trip you take and for any other deductible driving you do, as well as the reason for the trip. Most office supply stores carry notebooks designed for this purpose in a size that's convenient for glove-box storage. Keeping car repair records systematically shows your engagement in your car's performance. Those records can be invaluable if you have major repairs or when selling your car.